Jiles Perry Richardson Jr. was an unlikely rock star. While he was actually quite shy in person, his "The Big Bopper" persona was his own creation; a larger-than-life, hip talking alter-ego that was a perfect outlet for J.P.'s experience as a DJ on the popular radio station in Beaumont where he worked. "The Big Bopper" was a combination of his size and the DJ phrase of the day, 'bopping'. J.P. was born on October 24, 1930 in Sabine Pass, Texas and his family settled in Port Arthur. He had a pretty typical childhood, attending public schools and playing football in High School. Although he didn't continue his football career, he did attend college in Beaumont, where he worked at a radio station. He married in 1952 and even tried his hand at singing country & western, but his single failed to chart. After a stint in the U.S. Army, he worked as a DJ for KTRM radio station and began using the moniker "The Big Bopper" in 1957. Back from the Army and with a growing family (his daughter was born in 1957), Jape (as he preferred to be called) came up with the idea for the "Jape-a-thon" to earn some extra cash in May of 1957. He would broadcast for six days straight, establishing a world record for continuous broadcasting. He was given an engraved watch to commemorate the "Jape-a-thon" and he was wearing this watch when he perished in the plane crash with Buddy Holly in 1959. Not deterred by the failure at country & western, Jape continued to write songs in his spare time. In 1957 he recorded "Chantilly Lace" (originally called "That's What I Like") as a b-side for another song. While the a-side got some airplay, the "Chantilly Lace" b-side eventually took off becoming one of the most played songs of 1958. The Big Bopper was a star and for most of 1958 he was on tour promoting his record. In addition to his own hits, J.P. had become a prolific songwriter, and his songs would later give hits for Johnny Preston (with "Running Bear") and George Jones (with "White Lightnin"). In addition to his songwriting talents, he was a visionary in another area of rock 'n roll, the music video. There have been many claims on who made the first music video, with groups such as the Beatles, Who and Kinks often cited as examples. Some have claimed that Ricky Nelson made the first music video in 1961. 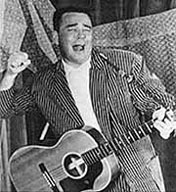 However, three years earlier in 1958, the Big Bopper actually recorded three music videos for his songs: "Chantilly Lace", "Big Bopper's Wedding" and "Little Red Riding Hood" (all 3 videos were recorded the same day). Plus, he also coined the term "rock video" in a printed interview in 1959. According to Bill Griggs, editor of the "Rockin' 50s" music magazine, the Big Bopper was convinced that video was the wave of the future and, at the time of his death, he was preparing to start production on music videos for TV and a specially designed jukebox which would play videos. Jape often said that he wanted to stay in the business just long enough to earn money to buy his own radio station. He didn't like being away from his family and didn't care much for the egos that most stars displayed. However, the Winter Dance Party sounded like a good idea at the time for just such money making. This package tour, with other stars Buddy Holly, Ritchie Valens, Dion & The Belmonts and Frankie Sardo, was to play various remote locations in the mid-west. However, the tour was plagued by misfortune after misfortune; it was one of the harshest winters on record for the area and the bus continually froze up. Jape caught the flu in these frigid conditions and became aware that Buddy Holly was chartering a plane for his band after the Clear Lake Iowa show. With the flu, another night on a bus without a working heater did not look promising for J.P. He convinced Waylon Jennings, Buddy's then bass player, to give up his seat to so that he could get some much-needed rest before the next show. Ritchie Valens then convinced Tommy Alsup, Buddy's guitarist, to give up his seat on the plane - the result ultimately decided by the coin flip of a 50-cent piece. On February 3, 1959 at 1a.m. the plane crashed only 8 miles after takeoff, killing all three stars and their pilot. Like Buddy Holly, J.P. left behind a pregnant widow. But while Maria Elena Holly lost her child due to miscarriage, Jay P. Richardson was born 84 days after his father's death. 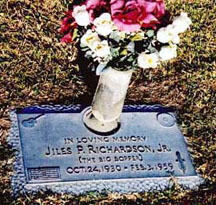 J.P. Richardson was buried in the Beaumont Cemetery on February 5th. Like the deaths of Buddy Holly and Ritchie Valens, one can only speculate at the potential the Big Bopper, had he not perished in that fatal plane crash. Who knows, we could have been watching "Bopper-Vision" instead of MTV? The songs of the Big Bopper live on today in such modern bands as Dash Rip Rock and their popular cover version of "White Lightnin". And the legacy of the Big Bopper is perpetuated by his son, Jay, who billed as the "Big Bopper Jr." continues to pay tribute to his Dad's music on stage. While there have been movies made on the lives of Buddy Holly and Ritchie Valens, there has yet to be one made on J.P. Richardson. However, Jay Richardson says that a major motion picture is still a possibility, or even a TV movie. Hopefully, a movie on the Big Bopper won't suffer the same fate as the much fictionalized movie accounts of Holly and Valen's lives. Most importantly, hopefully we will see the Big Bopper take his rightful place in the rock 'n roll hall of fame for his contribution to rock 'n roll. My fascination with the Big Bopper came quite by accident. In November of 2002, I was making a road trip from Atlanta, Georgia to Houston, Texas. As I was planning my route and checking maps, I noticed that I would be passing through the city of Beaumont, I vaguely remembered that this city was Texas, the home of the Big Bopper (and his final resting place). I decided to visit the gravesite of the Big Bopper if it was close enough to the interstate. After searching on the internet, I found that Forest Lawn Memorial Park was in fact a doable option and made it part of my trip. However, when I arrived at the cemetery, I had no idea of the size and I had no idea where to start looking. Luckily, the main office was open and the person on duty directed me to the site. I took a few pictures and reflected on the career of Jiles Perry Richardson. Postscript: Spirit of the Big Bopper?